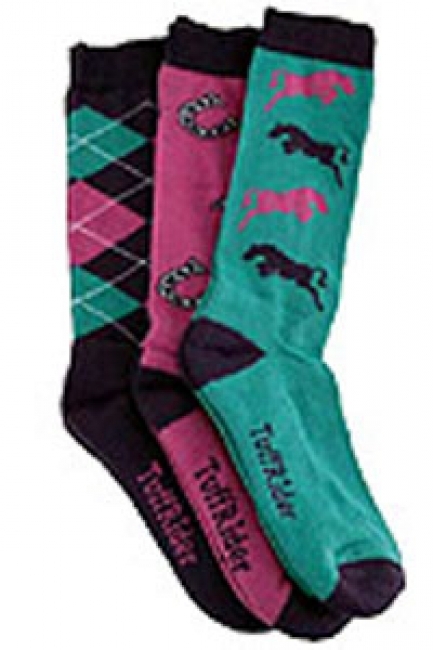 These socks come in packs of three and have the same whimsical horse design as TuffRider's Whimsical Horse Tee Shirts and Breeches which we also carry! These socks are made of cotton / spandex material and are good for riding in or for just wearing around. They come in packs of three and each pair is a different color. Comes in packs of three. Coordinates with TuffRider's other Whimsical Horse apparel. Ariat Youth Terrain Distressed Brown Boots !